The Ulchi are Manchu-Tungus speaking peoples who gave the word “shaman” to the world. These people have inhabited the regions of the Amur River since the Neolithic epoch. Their oral histories recount their earliest beginnings in the midst of the Pleistocene landscapes of southeastern Siberia. This book reveals the essential and comprehensive teachings of Classical shamanism. Wonder tales of enchanted animals, legends of the first ancestral shaman, creation stories, ways of nature, and the intimate relationship between humans and spirits explored and discussed from in-depth conversations with the elders and last remaining shamans of the Ulchi people. This book is a rich repository of commentary, elders’ memories, personal and cultural narratives, all given life and skillfully strung together by an author who appropriately has little presence in the text. The book itself is easy to read, with language accessible to all skill levels. When reading this book, one of the first things that became apparent to me was how much of the actual text was direct quotes and commentary given by the elders and shamans of the Ulchi people. I finished this book feeling more like I had just participated in a timeless dialogue, or a lengthy and pleasant conversation over an intimate meal, rather than turning pages in a book. Academics, students, lay scholars, and the curious will all find something to value in this book. Those interested in healing will perhaps find something that sings intensely to their souls. An excellent book on this unique topic of Siberian shamanism in the Ulchi society. 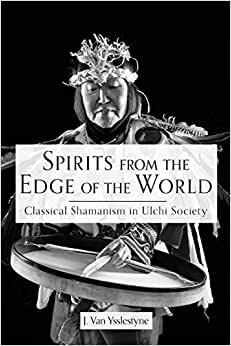 This book was created based upon the author’s many years of discussions and experiences with Ulchi shamans, plus her own collection of rare original source information. The book includes many original photos. A well written and organized book, which I believe will become a classic reference on the subject. I recommend this book to any serious student or researcher. This book is a treasure. I love how it is presented, the quotes from the shamans given as they were spoken, without interpretation. What a boon, that Jan Van Ysslestyne recorded so much of her years with the Ulchi, and is sharing that with us. For me, the book felt like listening than reading. So good. The author J. Van Yssletyne brings you on a surprise and delightful journey into this unique world of the Ulchi people. She takes us to the world of Classical shamanism by the peoples who gave the word shaman to the world. The commentaries by the elders and shamans of the Ulchi are deep and compelling. Overall a great read about authentic shamanism rather than those ridiculous New Age how-to-books (and best participatory research since Brown's "Mama Lola"). The book itself is lovely, filled with photos. Recommend to all levels of interest, great gift.